Lattemama: Halloumi and cabbage stir fry - the long-winded way - Now with pictures! Halloumi and cabbage stir fry - the long-winded way - Now with pictures! I was looking in my fridge the other week trying to decide what to eat that wasn't pancakes or sausage and pasta. Neither of those are very low on calories. 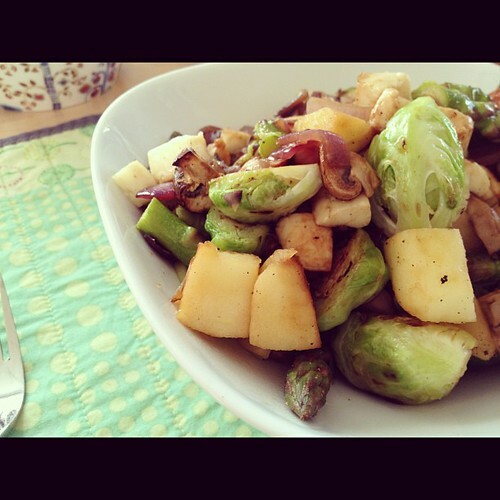 I had a bag of fresh, lovely Brussels sprouts, onion, apples and mushrooms that started to look sad. I also had a block of halloumi cheese. I started by dicing up the onion and dumping it in a non-stick pan. I added some liquid margarine just to get it going. While it fried I cleaned the sprouts and halved them dumping them in as they were ready.I put a lid on and let it steam. Sprouts are delicious but not if they are too uncooked - and also not if they are over cooked. Then I diced the mushroom straight into the pan and stirred some more. Finally an apple - peel (absolutely not necessary), core and dice. Toss it in and stir to cook. Add some salt and pepper - go easy on the salt as the cheese is quite salty. Curry is nice with the apple but don't mesh very well with the cheese - decide for yourself. When the sprouts are almost done dice the cheese and toss it in. Shift the veggies to the side in the pan to give the cheese a chance to brown and crisp up a little before stirring it all together. Serve it all in a huge bowl/soup dish with some sweet balsamic reduction. I get one made from Figs and Date balsamic vinegar. One slice of bread to mop up the juices once you're done. Sit down and stuff your face with it! But don't do what I did and have this for lunch and dinner three days in a row. Your mouth will love you, but your stomach will hate you and we all know who wins out in that contest? If you use a lot of veggies this dish is incredibly filling. Don't hesitate to add other kinds of veggies too - carrots, broccoli, leeks - also change it up with different kinds of cabbage. I made it with Savoy cabbage once and that was great too. Using different varieties of apple changes it too. I prefer a tart kind that's not too sweet. The best part is if you go without the margarine in the beginning you only have to count points for the halloumi. I use 100 g for this dish (the cheese comes in 200 or 250 g blocks here) which adds up to 8 or 9 points. None of the veggies add points and the balsamic I use is free too - but check your own to make sure. Don't forget to count the bread.